Past Commodore Mel Wallbank has been appointed as Port Captain for Gore Bay, Ont. (NC-14). Mel was born in England, immigrated to Canada at 14 months of age and grew up in Cambridge and Kitchener, Ont. He started sailing in 1968 on a 13-foot Fireball dinghy on inland lakes and on Lake Huron in Southampton and Port Elgin. In 1976 he bought, trailered and sailed a Hobie 16 with enthusiasm. In 1982 he immigrated to Port Huron where he has lived since, for 36 years. He is married to Mariette Labrosse, who is a fine cruising companion and outstanding cook aboard Bliss. He is a proud father of a grown son and daughter, grandfather of three children. Mel bought and sailed a new C&C 32 (Intrigue) from Irish Boat Works on Lake Charlevoix in 1984. In 1986 he bought and sailed extensively on a new C&C 41 (Frances J) from the Clinton River dealer. Mel joined the GLCC in 1992 following his first summer season cruising the wilderness regions of the Great Lakes. He commissioned C&C Yachts to build a semi-custom 51 (Bliss) in 1995 which is his current ride. Mel was solicited and elected to the GLCC Board in 2005. In short order became the scribe to the then current Chairman of the Planning Committee. From approximately 2006-2011, Mel served various Commodores as Chairman. During his tenure, GLCC’s highly motivated, focused, and capable Committee implemented numerous policies and guidelines with Board approval, adding much needed basic structure. 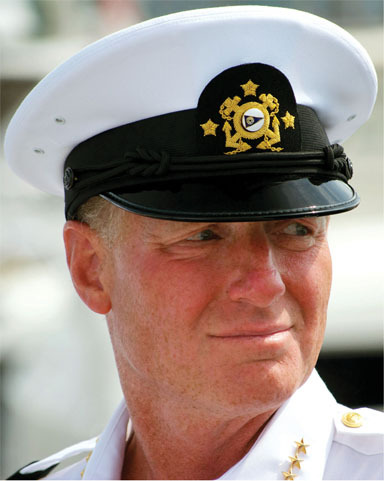 With Board approval, he orchestrated and facilitated every aspect and detail of establishing the GLCC Headquarters in Port Huron, Mich. with the help of Rear Commodore Tim Boelke who was the Treasurer at the time. Several years ago Mel served as a member of the original Website Committee that made our content available online. He was elected Vice Commodore in 2010 and 2011, elected Commodore and served with distinction in 2012 and 2013. Mel has contributed to numerous Harbor Reports over an extended period and is still bumping rocks on occasion! Great Lakes sailing is his life as he will always be a cruising sailor. Mel is devoted to the purpose, mission, and legacy of the GLCC, including our exclusive and invaluable Port Captain program. If you’re heading by Gore Bay, please give him a holler.